The technical term for the whistling that can sometimes occur with even the best hearing aids is “acoustic feedback” or just “feedback,” and while it can be an annoyance, it does not mean your hearing aids are malfunctioning. 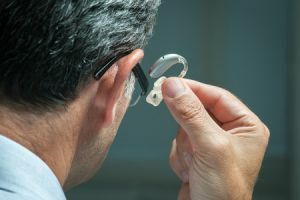 Technological advances in hearing aids have made feedback whistling much more infrequent than in past devices, but we have yet to see a hearing aid that willnever whistle under certain circumstances. it is a normal part of hearing aid function. Acoustic feedback occurs when amplified sound exiting the hearing aid from the speaker (receiver) gets picked up again by the device’s microphone in what becomes an acoustic loop. It sounds like a squeal or whistle, and it can be embarrassing and annoying for wearers as well as those around them. Almost all hearing aids will create feedback when something is placed next to the microphone. 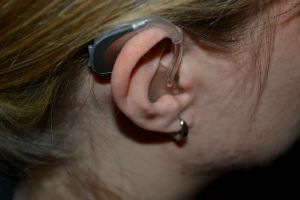 For example, when wearers cup their hands over their hearing aids while they are in the ears, they will usually whistle. Properly fitted hearing aids should not whistle during ordinary wear when there is nothing near the microphone. hearing aids that are not seated properly in the ear. blockage in the ear canal such as earwax. Any time there are gaps between the hearing aid case and your ear, sound from the end of the hearing aid can leak out of the ear canal and find its way back into the microphone. Today, most hearing aids have features built into their circuitry that reduce feedback. These systems quickly detect the feedback and eliminate it before it becomes audible to you or others nearby. Mosthearing aid manufacturers include basic feedback reduction into even their basic hearing aids, but more sophisticated, high-end products may have more advanced feedback reduction systems. If you are new to hearing aids and feedback is a concern for you, be sure to ask your Hearing Care Professional about hearing aids that most effectively control it. And, if you already wear hearing aids and have trouble with whistling, visit your Hearing Care Professional. They can determine the cause of the feedback and make adjustments to correct it. Please call The Hearing Group at (973) 542-4031 to schedule an appointment. Hearing aids are delicate mechanisms, so even if you’ve double-checked yours before you head on vacation, there is still a chance things could go a little haywire. What do you do if your hearing aid malfunctions when you’re out of town? Packing an adequate hearing aidtravel kit might be able to solve minor problems, but in the event you can’t fix the issue yourself, you’ll have to locate a local hearing health professional. Before seeking an audiologist, try troubleshooting the problem yourself. 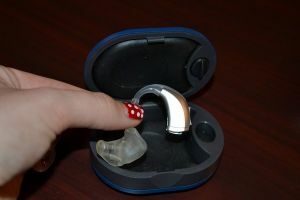 You could save yourself a lot of time and money by knowing a few quick tricks when your hearing aid starts acting up. Time and money is even more valuable when you’re on vacation, since you don’t want to interrupt your beach time unless it’s absolutely necessary. to select a hearing healthcare provider! If your hearing aid is weak or not working: First check the battery to make sure it’s inserted correctly and functioning properly. Next, check that the volume control is set to a level you can hear. Then, check the vents and receiver openings to make sure they’re not clogged with earwax or dirt, and that the tubing is connected properly. Finally, check to see if the microphone opening is clogged. If the sound is distorted or inconsistent: Replace the hearing aid battery, because this could be a sign that it’s weak or defective. Get rid of any lingering moisture in the tubing with an air blower and replace any cracked cords. If the hearing aid is emitting feedback: Check that the volume isn’t turned up too high, because that can cause your hearing aid to give off a whistling or squealing sound. Be sure the earpiece is inserted correctly into your ear and the microphone isn’t covered by any clothing. If the above troubleshooting tips don’t resolve your hearing aid’s issue, then it’s time to seek an hearing care professional. If any parts are missing or damaged, particularly the tubing, a visit to the audiologist for hearing aid repair is necessary. Persistent feedback is also a sign you need to take the hearing aid to be looked at by a professional, since feedback can be a sign of an improper fit. Since your ear changes shape over time, your hearing aid can become slightly dislodged, creating a whistling or squealing sound. Your hearing is important, so you shouldn’t pick just any hearing care professional simply because you’re away from home. Doing some quick research before you head to the doctor can have a major impact on the rest of your vacation. Reviews: Online reviews are easily accessible, and while they don’t always present a full picture of the doctor and the clinic, the patients’ overall experience is often clearly communicated. Healthy Hearing offers a quick and easy ‘find a professional‘ section complete with reviews! Insurance: Insurance companies often review and rate the health care providers they cover. A quick phone call to your company will present you with several options. Referral: Ask around! If you’re visiting someone you know in the area, ask for a referral. Word-of-mouth referrals are often the happiest customers. Credentials: Check the hearing healthcare provider’s degree or credentials. A Doctor of Audiology (Au.D.) is the highest degree an audiologist can earn. Other common credentials include Certificate of Clinical Competence in Audiology (CCC-A) and National Board Certified in Hearing Instrument Sciences (NBC-HIS). Preparing for the unexpected can be difficult, especially when you’re in unfamiliar territory. But just because you’re out of town doesn’t mean you’re at the mercy of the fates. The Internet can help you quickly find a quality audiologist in your area. Found this great article and wanted to share it. As author Stephen R. Covey knows, the key to success lies within you; all you have to do is find it, stick a spigot in it and turn on the tap. As with Covey’s The 7 Habits of Highly Successful People, the seven highly effective habits of hearing aid users are simple and straightforward. In many cases, hearing loss is a permanent condition, and so it’s something you have to learn to live with. With a few tweaks to your daily routine and an adjustment on your mental perspective, you too can be a highly successful person, hearing loss and all. If you’re lucky enough to have the opportunity to improve your condition with hearing aids, wear them! They won’t do you any good sitting in your nightstand. Even though you might be self-conscious about the way they look, your hearing loss is infinitely more noticeable when you don’t wear them. seven easy, but effective habits! When you miss part of a person’s speech, don’t give up on the conversation. Instead, look for ways around it. Where your ears fail, your eyes and brain can often fill in. Use visual clues like facial expression, body language and lip reading to help fill in the gaps your ears can’t. Look at the speaker when he or she is talking, and pay attention to all the little details. When you have hearing loss, it’s extremely important to be proactive on your own behalf. When you’re in a new place or trying a new activity, let the people around you know that you have hearing loss. You’ll be surprised at the difference it makes in your experience. Most of the time people won’t know you have hearing loss, unless they can see your hearing aid right away. Once they are aware, they can offer you the option of additional services like closed captioning, Teletype phones or hotel room visual alert kits, and make the extra effort to communicate with you in person as well. Hearing aids don’t completely restore your hearing, but they should do a pretty good job of improving your hearing capability. If you’re noticing any problems or if you suspect something is out of whack, ask your hearing health practitioner to check them out. If yourhearing aids aren’t working properly, then you’re wasting a whole lot of money. An easy thing to do, right? Such a simple action can significantly impact the life of your hearing aid. Moisture builds up in your ear and your hearing aid throughout the day, and opening the battery component door at night allows the internal mechanisms to dry out. Batteries can die at any time, and you should know from experience that it always happens at the most inconvenient moment. Head that problem off by keeping an extra set of batteries in your purse or your car. Having a spare can determine whether you have a great night or a really difficult one. When you’re not wearing your hearing aids, you should store them in a cool, dry place like your nightstand. If you live somewhere humid, make sure to store them in a drying container. Whatever you do, don’t leave them in the bathroom overnight where they could be subjected to shower steam and splashes of water from the sink. Employing these seven steps in your daily routine will make you a highly effective person with hearing loss. While your hearing loss may present a few obstacles, most of those obstacles have simple solutions. You just have to know what they are. Reprinted with permission from www.healthyhearing.com. Please visit their website for the original article “Seven highly effective habits of hearing aid wearers”. The warm weather is always a welcome respite from the icy cold of the winter months, and it’s understandable why so many people spend so much more time outside while the sun is actually inviting, instead of just a tease. But if you wear hearing aids, the heat is not your hearing aid’s friend and can do some serious damage if you’re not following proper maintenance procedures. So, in celebration of our favorite time of year, we’ve compiled a list of summer dos and don’ts for hearing aid users to keep in mind while out in the elements. Don’t: Leave your hearing aids in direct sunlight or in extreme heat, like inside your car. Do: Store your hearing aid and hearing aid batteries in a cool, dry place. Excessive heat can damage the delicate elements of your hearing aid, shortening its life. This damage is caused not only by the heat itself, but by the moisture that can develop inside the hearing aid as it endures severe temperature changes, like going from a cool, air-conditioned living room to the balmy heat of the backyard. Additionally, the outer casing is made of plastic, which is liable to melt in high temperatures. Don’t: Allow bacteria or fungi to grow on your hearing aid. Do: Keep disinfectant towelettes handy, at home or in your wallet or purse, to clean your hearing aids regularly. The hot, humid weather is ideal for germs, bacteria and fungi to grow and thrive, so regular cleaning is essential to keep your hearing aid free of unwanted guests. Small microbial towelettes are available that fit snugly in your purse, wallet or pocket, keeping sanitation always within reach. Don’t: Wear water-resistant hearing aids in the water. Do: Make sure to note the difference between waterproof and water-resistant. Your hearing aid won’t be able to withstand water unless it is a proper waterproof hearing aid. Many water-resistant hearing aids and hearing aid accessories are also available, but these only help protect against minor water intrusions like splashes, rain, or moisture accumulation. Be sure to know the difference before you go swimming. Don’t: Ruin your vacation by forgetting one of your hearing aid accessories. Do: Pack back-up supplies, like batteries and tubes. You know that feeling you get right before you leave for vacation, that nagging feeling that you’re forgetting something important? Make a checklist beforehand that includes all the extras you need for your hearing aid, especially batteries. What good is hiking in the rainforest if you can’t hear the birds or the monkeys? Don’t: Take your hearing aid out or turn it off while going through airport security or while in flight. Do: Keep them on for important safety and security instructions from airport officials. Some hearing aids can set off airport security scanners, but you can alert the officials to your hearing aid ahead of time verbally, or by downloading an official TSA Notification Card that provides you with a little discretion in communicating your disability to security officials. Your hearing aid is also exempt from the no-electronic-devices policy on board the plane, so you are free to enjoy that in-flight movie. If you do your due diligence to protect your hearing aid from the sun and heat, and make sure to plan ahead and pack a hearing aid travel kit before leaving home, you can ensure your hearing aid won’t get in the way of your summer fun. Reprinted with permission from www.healthyhearing.com. Please visit their website for the original article “Hearing Aid Dos and Don’t for The Summer”.